Considering the purpose of a filter, most of them, require periodic cleaning to extract the accumulated contaminants. The way in which the cleaning takes place, is either by withdrawing them from their housing or by cleaning through a process that keeps them in their constant place. The latter can only occur if the flow of fluid is temporarily stopped. The process of back-flushing, therefore, is undertaken to clean a filter that can be reused due to its working condition. The other use of back-flushing is when solids are intended to be retrieved from the surface, and when that is the reason for deploying a filter. Most commonly, this process is undertaken by reversing the direction in which the fluid flows through the filter, which pushes off the contaminants that have settled on the surface. This process requires the regular filtration process to stop and therefore, any system that requires continuous filtration employs two filters that run parallel in a duplex arrangement, with the piping and valves arranged in a way that the main flow can be replaced by the alternate filter. 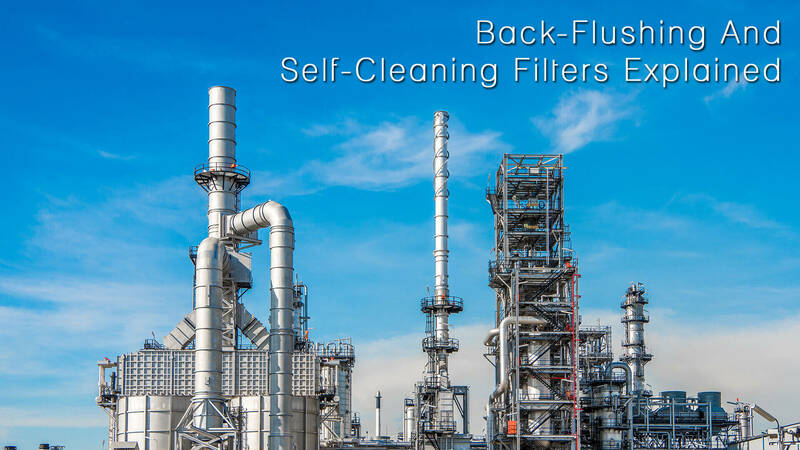 Internal back-flushing is the process of redirecting a part of the filtrate for washing and external when an outside fluid is used as the cleaning agent. Often, combinations of fluids are used for cleaning, including compressed air. Certain cartridge back-flush filter systems are induced with suitable elements to filter a variety of elements, ranging from water to various chemicals, to toxic materials. Usually, these are polishing filters with a low capacity for dirt-holding and should be used only when the contaminant loading is under 1000ppm. For higher contaminant holdings, there are various other filtration systems or the solid-liquid separation method that can be used. Nonetheless, there are certain cases where back-flushing systems work optimally with fluid viscosity that runs as high as 50,000cp. This is because, in such systems, fluid velocity is not the primary factor toward cleaning the filter. The contaminant holding capacity is usually defined by the intervals between required or routine back-flushes and the type of back-flushing (internal or external) undertaken. In the event that a combination of liquids and gases are used for back-flushing, a blast of gas is undertaken to dislodge the contaminant and then the liquid flow is used to flush out the contaminant from the system. Every system requires a specific process for optimization that is unique to that filtration process. Therefore, a back-flushable cartridge system must be categorized and sized by factoring in the pressure and contaminant holding capacity. The pressure implies the speed at which the liquid can flow when reversed, which should be, at a minimum, equal to the speed of the normal flow of the filter. In an internal back-flushing system, this is generally a cause for concern, because the process outlet pressure is lowest during back-flush cleaning. Finally, the process of back-flushing can be automated through electroneumatic control valves, which can be managed by a dedicated programmed logic controller. This is done through the setting of a back-flush interval and routine adjustments through operational experience. This is a small, but significant, group of single cartridge filters that are deployed in a manner, wherein they can be continually cleaned through an automated mechanism. Self-cleaning or automatic filters, is installed through a cartridge element being mounted vertically in a housing that already contains the cleaning mechanism, which moves through the outer surface of the element and cleans as it goes along. The movement is undertaken in a way that covers the entire filtration area before return to starting position. The cleaning mechanism is a reverse jet of filtrate that is deployed inside the element, or a jet on the filter surface, or even a brush or scraper along the filter element. The type is dependent on the kind of filter and its specific functions.